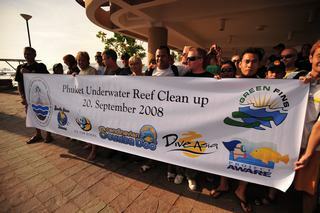 On Saturday, 20 September, more than one hundred divers on board the dive boats of Dive Asia, Sea Fun Divers, Scandinavian Scuba Doo and South Siam Divers, together with divers and staff of the Phuket Marine Biological Center joined forces with 500,000 volunteers in more than 100 countries in the world’s largest shoreline and underwater clean-up event. Dive Asia’s boat carried twenty-six divers and eight instructors and dive masters to Kai Nok Island east of Phuket. 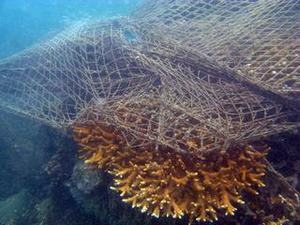 They removed a large part of a huge fishing net which had drifted into the fragile coral reef. Sea Fun Divers, Scuba Doo, and South Siam Divers went to Raja Yai Island south of Phuket. Unfortunately, the boat from Scuba Doo had a technical problem on the way out and had to abort the mission. The remaining divers on board the other three boats where able to remove 300kg of fishing net and other debris found on the seabed. 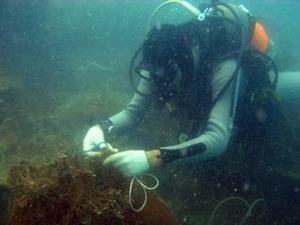 The largest amount was removed by Dive Asia and South Siam Divers. 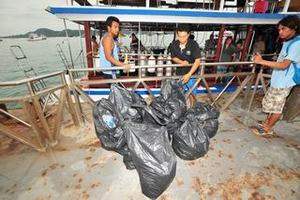 Both groups removed great portions of drift-away fishing nets. Three hundred kilograms collected by seventy divers might not sound like much but removing the fishing nets especially was a lot of hard work. It took one diver one hour to carefully remove just a square meter of net out on the reef. The divers had to work and move very slowly to avoid damaging the fragile coral reefs. Dive Asia, Sea Fun Divers, Scuba Doo and South Siam Divers thank all the volunteers for their commitment to marine conservation. Local clean-ups are a fantastic example of how people can work together to take action and make a positive contribution to the local community. Thanks to the commitment of passionate local divers and volunteers we have made a real impact cleaning up the local area. It is amazing what can be achieved and we’d like to thank everyone for their efforts. Juergen was interviewed from a local TV channel and you can watch the Video here on Youtube. Ju was born on the 7th of August in Phatthalung on the east cost of the Malay Peninsula in southern Thailand. After obtaining her degree in Accounting from the Rajabhat University of Yala she began her first job as a cashier at one of Phuket’s many hotels. 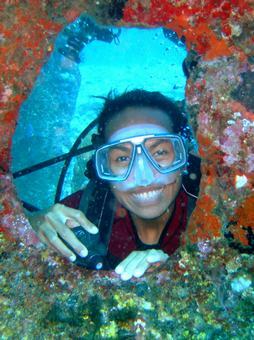 Ju joined Dive Asia’s Sales and Reservation Team in October 2004. She, along with her colleague Nan, became the backbone of the Administration Staff making sure that you get picked up on time at your hotel, stocking food and drinks on board and finally ascertaining that your day was well organized. Ju also takes care of hotel reservations and books non-diving tours. Of course, she is a diver as well and today, as an Advanced Diver, has twenty-seven dives logged mostly around Phuket and a few in the Similan Islands. In her free time Ju likes to read good novels, listen and sing along to Thai country music, and enjoys movies such as “Armageddon” with Bruce Willis. She also likes to travel whenever she has the opportunity. Ju is a friendly and quiet person who enjoys listening to other people. These attributes make her the perfect person to find the right tour or equipment for you. Bee was born on the 14th of March in Surat Thani on the Gulf of Thailand. She fell in love with the sea in her early childhood and enjoyed her fist dive in 1999 at Sail Rock near Koh Tao. This first breath underwater changed her life entirely. Bee is an outgoing and talkative person who enjoys life at it’s fullest. It is hard to escape her positive attitude. In 2000 Bee became a PADI Dive Master and an Instructor in 2005. 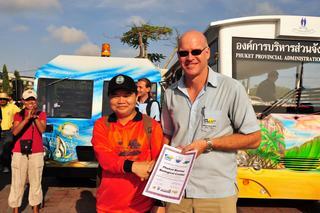 Since then Bee did more than three thousand dives all over Thailand and has taught more than 200 divers. 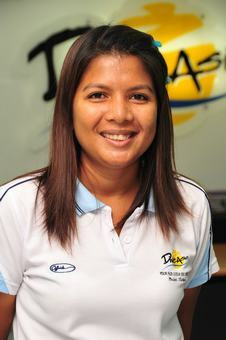 Bee joined the Dive Asia Team in October 2005. Her personality and love of diving quickly made her avaluable member of the pack. From November through April you will find Bee primarily aboard our Live-Aboard boat cruising the Similans. During the rest of the year she enjoys teaching new divers and working as a guide to Phuket’s local dive sites. As an active environmentalist, Bee was the perfect choice to implement the Green Fins Project, a United Nations-sponsored program, into Dive Asia. Bee’s favorite dive site is Elephant Head in the Similan Islands. She enjoys swimming through the gigantic rock formations and the sometimes narrow swimming troughs. She finds her beloved Clownfish here as well, in the shallow parts of the northeast corner. She loves to show others the underwater beauty of the Andaman Sea. Besides diving, Bee enjoys traveling, having a good meal with friends and singing karaoke. She also likes to watch the movie “Gladiator” with Russell Crowe as well as listening to the music and lyrics by one of Thailand’s greatest singers — Nantida Kaewbuasai. Her favorite book, believe it or not, is the Encyclopedia of Recreational Diving.